By Dale Johnson Posted: April 4, 2017 6:00 a.m.
There’s a new way to make that cup of coffee on campus more environmentally friendly. U of R students, members of the group Enactus Regina, are laying the groundwork for a more sustainable campus. A pilot project means coffee grounds at food outlets in the Riddell Centre are being recycled. The project is operated by the students in collaboration with Facilities Management. The pilot project began in January and runs until the end of April. Coffee grounds are collected each day by volunteers and project managers with Enactus. “We project to collect about 135 kilograms (300 pounds) of coffee grounds each week from Henderson’s Café, Chartwells, the OWL, and Common Ground, or a total of about 550 kg of coffee grounds in the first month. Over a one-year time span that would be about 6,360 kg organic coffee grounds from the Riddell Centre alone,” says Samia Nawreen, a fourth-year psychology student and one of the project managers on Team Compost. Coffee grounds, when added in proper amounts to a compost, can be an excellent source of nitrogen. The collected coffee grounds are delivered to PV Waste Solutions, which uses the collected organic waste to produce compost which will be available to people in Regina for applying the fertilizers in their yards or for farming. “Collected coffee grounds are stored in a three cubic yard Loraas organics bin outside, in the RIC loading dock. Depending on how fast the bin fills up half the way, Loraas will come to pick up the organic waste once every two to three weeks. There is not much space on campus at the moment to compost the organic wastes, hence they are being taken away to PV Waste Solutions, Regina’s only bioremediation and compost facility. Our goal is to work towards establishing a composter on campus in order to compost the university’s organic waste in-house,” says Monica Purewal with Enactus Regina. Funding from the President's Advisory Committee on Sustainability (PACS) absorbs the cost of bin rental, pick-up and delivery to PV Waste Solutions – about $3,000 – during the project. “Enactus Team Compost’s long-term goal is to establish an industrial composter on U of R campus that will regulate all the organic wastes generated on campus,” Nawreen says. She also says there’s an educational component to this recycling project. “Enactus Team Compost has reached out to different faculties and departments at U of R and many professors have shown great support and interest in the Composting on Campus pilot project. This project has been incorporated into the BUS 100, ENG123, and BIOL101 course syllabi as an optional term assignment for students,” says Nawreen. Karla Thurmeier, general manager at Henderson Café, welcomes the initiative. “I am glad the University has started this program on campus. We have been composting our coffee grounds for about two years but we had to take it off campus ourselves. I hope this is just the beginning of many other recycling initiatives to come in the future,” she says. This is yet another way the U of R is going green; and sustainability is part of the university’s strategic plan. Among the measures being enacted are campus-wide recycling, carpooling, cutting greenhouse emissions, more bike racks and composting. “Any reduction of waste that is redirected from the landfill is a win. We hope that the students are able to continue this project over the summer months and possibly step up the program to potentially other food venues on campus, including the federated colleges as well as office kitchens on campus. The students’ report will allow us to determine the cost per kilogram to divert this from landfill,” says Elaine Groenendyk, manager of custodial services at the U of R.
Enactus students routinely get involved in community empowerment projects and business ventures with the hope of creating a positive impact on the world. There are about 50 students members of Enactus Regina from various faculties. The students also drew inspiration for their composting plan following a sustainability seminar they attended recently. 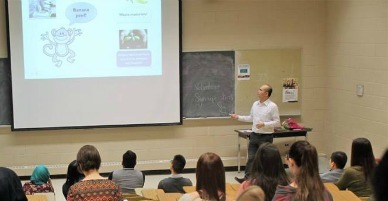 They heard from Gord Joorisity, executive director of Innovation Place, and Dr. Kelvin Ng, associate professor in the Faculty of Engineering and Applied Science. Ng discussed issues regarding solid waste management nationwide. He also talked about the work done by U of R engineering students to promote progressive changes in the environment and for the campus. Joorisity shared with the students the sustainability initiatives that have been established at Innovation campuses in Saskatchewan. “Taking this small step of ensuring our campus is sustainable will eventually make a great impact on our environment,” says Nawreen. “Our project also provides a pool of research and innovation opportunities for students from every faculty. We hope to take this project further and present the U of R campus as one of the leading Canadian schools in environmental sustainability on a global platform". Team Compost’s goal is to help implement a campus-wide composting program with hopes of involving more students in the project. The long-term goal is to establish an industrial composter at the University, that will enhance biodegradable waste management allow greater research and educational opportunities for students. “Phase two of the project includes incorporating additional organic materials, for example, vegetable scraps from the kitchens, and expanding out to the rest of the campus including the Federated Colleges. The project will continue over the summer 2017 semester in order to maintain continuity. The short-term goal for this project is to establish student self-composting facilities in the campus cafeterias,” says Nawreen. “Our project provides a pool of research and innovation opportunities for students from every faculty. We hope to take this project further and present the U of R campus as one of the leading Canadian schools in environmental sustainability on a global platform,” she adds.